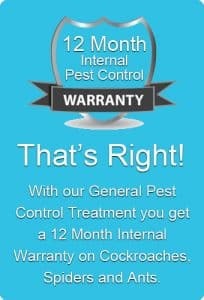 In Fact most of our internal Pest Control come with a warranty. What does that mean. We will come back and treat the problem area at no extra charge.In addition to the internal warranty our external treatments have a warranty as well. So what does the 12 month warranty cover on the inside. Internal Ants , Cockroaches , Spiders , Silverfish. 3 month warranty on Fleas , German Cockroach and Bed Bugs Of course this is conditional on you following our recommendations. As well as the inside Pest control Treatments, we have external Pest Control treatments warranty. But due to outside pressures it is not possible to offer a 12 month warranty . But we do offer a 3 month one for all insects except for mosquitoes and flies . In fact all we can offer for mozzies and flies is a substantial reduction in these annoying insects. Usually you will get between 4 to 6 weeks relief. So over summer we can offer a 4 weekly service to keep them at bay. As well as a Pest control treatments Warranty your Termite Protection (Barrier) has a warranty Subject to an annual Termite Inspection. 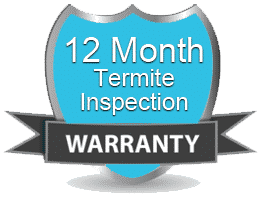 Also we offer a 12 month warranty on your termite inspection . This is subject to you putting in place our recommendations. So if you want a pest control give us a call or fill in the online quote . All our Pest control treatments are safe for your family and pets.We only use the latest and best products on the market . So you can be confident that you will have the best possible treatment around. Pest Control Brisbane Ipswich, Gold Coast and all surrounding suburbs. Give Vicki or Lauren a call now to book in your service on 07 32008586. Book your pest control treatments and Termite inspection together for $295.00 and save $85.00.